Is Your Utility the New Amazon for Energy? As the weather begins to heat up across the country, now is a good time to begin thinking about devices that can improve your energy efficiency and reduce your monthly energy bill. For many consumers across the country, researching and selecting devices like smart thermostats and energy-efficient appliances might be a bit easier thanks to their local electric utility. In recent years, several utilities, including Georgia Power, Xcel Energy and ComEd, have begun offering e-commerce platforms to their customers not unlike the digital experiences they’re familiar with through Amazon, Zappos and other online retailers. 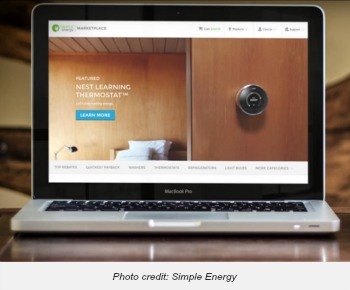 Instead of everything “from A to Z”, these online storefronts are one-stop shops for your home energy needs. And in addition to cost savings realized from the smart energy products, you may be able to immediately save by easily applying rebates at checkout. Many utilities offer significant home energy improvement rebates each year to customers. These discounts, which can be applied to energy-saving products like LED lights or WiFi-connected thermostats, encourage a reduction in energy usage from consumers, which, in turn, can help utilities meet their energy efficiency targets. Traditionally, these discounts have been offered only as mail-in rebates, and consumers rarely used them. A study from 2014 showed that only seven percent of consumers took advantage of an appliance rebate in the prior year and only 4 percent claimed a rebate for other energy-efficient equipment. By shopping through an online marketplace offered directly through your utility, you can instantly claim a rebate at checkout – much like Amazon's “clip-a-coupon” feature. One click and you save. For example, if you're a customer of ComEd in Chicago and Northern Illinois, you might be able to purchase a six-pack of 60-watt-equivalent LED light bulbs for only $12 – or $2 a piece – after factoring in the immediate $24 rebate. The product page offers easy-to-understand information to help you select the right bulbs for your needs, and you can also browse product reviews from other utility customers that have purchased these bulbs. On the Georgia Power Marketplace, you can receive an instant $100 rebate on the latest generation of Nest thermostats, and there is currently a 50 percent discount applied to Honeywell's touchscreen smart thermostats at checkout. If you have any questions about the rebate, both ComEd and Georgia Power's marketplaces include a page of information detailing the rebate offer – you'll know exactly how much you'll save and when it will apply. All of the information is displayed in a simple manner that's similar to major online retailers. Many online marketplaces also offer extensive information on the product categories that are offered. Interested in learning more about Connected Home solutions? ComEd's Connected Home Buyer's Guide explains how each product can benefit you and also what products are compatible with each other. Will that Nest thermostat connect with your Google Home? Will those new Philips Hue light bulbs integrate with your Amazon Alexa? Check out their guide on Cross Brand Communication to find out. If you're considering make energy-efficient updates to your home or just adding some neat Connected Home gadgets this spring, contact your local utility or visit their website to see if they're currently offering an online marketplace. More and more utilities are moving this direction, and even if your utility doesn’t currently have an online retail platform, it likely will soon. By shopping through your utility, you may be able to save immediately through an instant rebate, and you’ll be offered a lot of cool energy products that can help you take control of your energy usage and save even more in the long run. While you’re at it, check out our latest video that shows how your relationship with energy and the electrical grid is evolving – including the impact of WiFi-enabled appliances, lighting and devices that you can buy to monitor home energy consumption through these new marketplaces.